I’ve never met a computer I didn’t like, but my very favorite PC (disregarding price) of all the ones I’ve reviewed for TR was the Corsair One Pro back in 2017. It ran fast, cool, and quiet in equal measure—and said measure was quite high indeed. I said “was” because I have a new favorite now. You see, quad-core CPUs and Pascal graphics cards are no longer the state of the PC hardware art. It’s 2019, and apparently, if you’re not rocking eight cores in your CPU and tensor units in your GPU, you’re old news. To that end, Corsair’s created a new line of One gaming PCs. 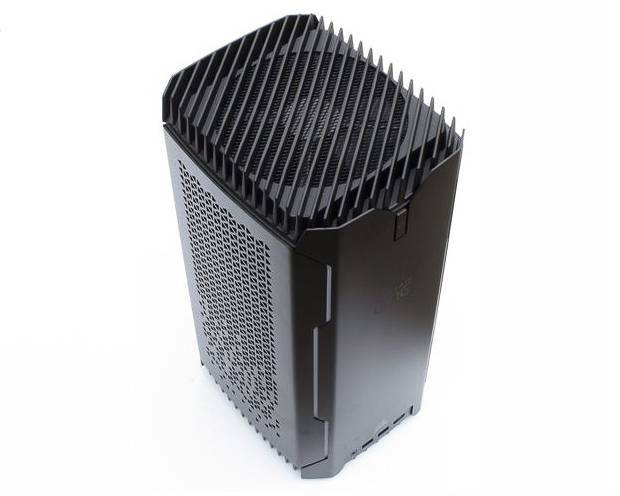 The one we have in the shop is the Corsair One i140, which is actually the bottom end of the new lineup. Above this model sit the Corsair One i160 and Corsair One Pro i180. I find it amusing that a machine with eight CPU cores and a TU104-based GPU is the bottom end of the One range. Corsair is making it clear with its branding that the One family is not fooling around, even though it’s intended mostly for fooling around. These are gaming PCs, after all. The combination of an Intel Core i7-9900K CPU and GeForce RTX 2080 GPU is not so far from what Jeff used to test the RTX 2080 originally, so we have a pretty good idea of what to expect from this machine. Besides the high-octane processors, Corsair outfitted the One i140 with 32GB of DDR4 memory running at 2666 MT/s, a 480GB Samsung PM961 SSD, and a 2TB Seagate Barracuda 2.5″ drive. The amount of memory is almost gratuitous, but given that the mini-ITX motherboard has only two RAM slots, the alternative would be limiting the machine to 16GB. I don’t have any complaints about the 960 EVO-equivalent SSD, but Corsair’s choice of hard drive is reprehensible. I’ll talk about that more on page three. Let’s have a look around and inside the Corsair One as a prelude to performance testing.